How Does Keeping Secrets Harm the Secret-Keeper? It’s well known that keeping a secret is often harmful to a relationship. Once it is revealed or found out – such as one partner having an affair, or engaging in addictive and damaging behavior – trust in the relationship is often deeply damaged. While this damage can often be repaired, the repair efforts are no simple matter, and may not be entirely successful. Keeping secrets is harmful to the person keeping it as well. 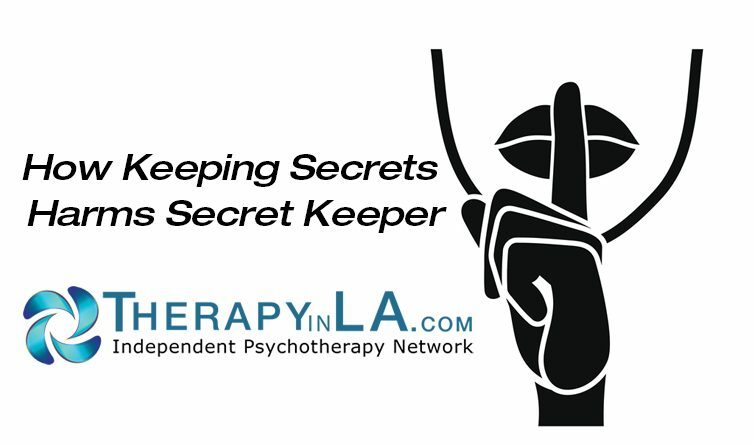 More anxiety, depression, poor health, and rapid progression of disease are all related to keeping secrets (http://bit.ly/KenPopeResearchWhySecretsHurtUs). One explanation of this experience is how much energy it takes to keep a secret: having to be careful about what you say, being sure not to reveal the secret when asked about anything related to it, avoiding certain topics, and directly lying. It can be exhausting to be so on guard and secretive. More recent research however indicates the harm comes from living with a secret and thinking about it. People tend to think about a secret a lot – to ruminate and to be distracted by such thoughts. We can feel alone, more isolated, and badly about not being authentic. The survey asked both how frequently someone concealed a secret as well as how frequently they thought about their secret. Interestingly, the frequency of concealment had no relationship to well-being. But, the frequency of thinking about it did lower feelings of well-being. Confiding a secret to someone does not reduce the frequency of their concealing it from others. On the other hand, confiding a secret does reduce how often someone’s mind drifts toward the secret in moments when it is not relevant. In other words, they are less distracted by the secret at times when such thoughts would interfere with their day-to-day lives and cause them distress. While such confessions might “feel cathartic and relieving,” it seems that the interaction that follows is what is truly more helpful. The listener often provides “emotional support, useful guidance, and helpful advice,” sometimes helping the individual feel “more confident and capable of coping with the secret.” The secret-keeper tends to obsess less and feel improvement in their well-being. One of the essential aspects of psychotherapy is to develop sufficient trust in the therapist that a client will reveal secrets about themselves, their relationships, their family history, etc. An empathic therapist will provide support for the client’s struggles with this aspect of themselves and their lives, as well as “useful guidance and helpful advice” (as the therapist gets to know the client, while not immediately in most situations). Given the complexity of most client’s lives and experiences, such a process is far from simple, and is an essential element of quality care. Alan M. Solomon, Ph.D. is a clinical psychologist in private practice in Torrance, CA. A member of the Independent Psychotherapy Network, he can be reached at 310-539-2772, or dralanms@gmail.com. ← Do We Worry Too Much as Parents?